What are the 9 most intense experiencesthe transformative steps that can improve your life starting now? How do these experiences generate happiness, health, and success in every aspect of your life? Why have people throughout the centuries valued them and why do so few people today realize their power? With this book, you can become the person you were meant to be and experience the life youve al… ways dreamed of. 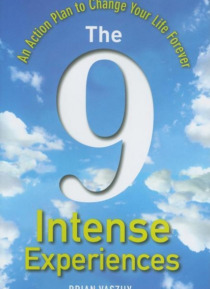 The 9 intense experiences are core to the teachings of the world's great spiritual and healing traditions. Prominent artists and leaders throughout history have understood their unparalleled importance. Now the latest research in psychology, neuroscience, medicine, and other fields is verifying how essential they are. In The 9 Intense Experiences , internationally acclaimed life coach and speaker Brian Vaszily shows you how to take the ultimate journey within yourself that will engage your body, mind, heart, and spirit, knock down the barriers that have built up inside you, and put you back in touch with the real you. After decades of professional and personal exploration, Brian Vaszily -- founder of one of the worlds most popular and unique personal growth websites and a rising star among todays top positive growth visionaries helps you achieve your 9 intense experiences. With Vaszilys gentle and inspiring guidance, youll learn how to abandon your stress and frustration and rediscover the wonder and possibilities in life. In The 9 Intense Experiences, you will learn how to: Enjoy your life more than ever before Achieve peak energy and success Ignite your, and others, brilliance Laugh off negative emotions Create deeply trusting relationships Discover your spiritual center The experiences youll discover in this life-expanding guide are truly intense, but getting there is more enjoyable and deeply satisfying than you can imagine.